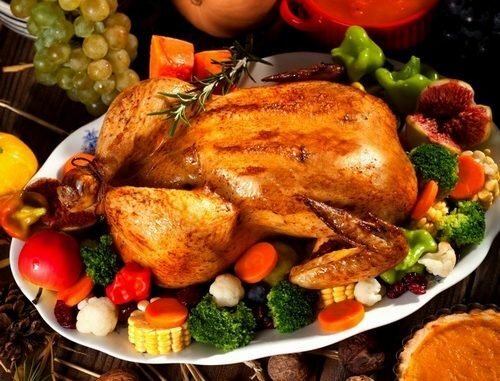 Roast Chicken on Salt - 90-Day Diet Rocks! Roast Chicken on Salt – Easy and Tasty! Roast Chicken on Salt is one of the easiest recipes with chicken. The recipe is suitable for consumption for lunch or dinner on Protein Day of 90-Day Diet. spices (pepper, paprika, garlic powder or other of your choice) – if you have spice mix for chicken, you can use it instead. Wash the chicken before cooking. Preheat the oven to 356 degrees F or 180 degrees C. Then combine the oil with spices you prefer and rub the chicken with the mixture (in and outside). Take a pan for roasting and pour the whole package of salt into the pan. Put the chicken on the salt. It won’t become salty, don’t worry! Roast in oven for an hour. When it’s ready, wait for 5-10 minutes and get the chicken out of the pan or it will take to much salt.